With our free bullet journal app you can make beautiful printables in minutes without having to draw each element. We offer hundreds of free bullet journal element that can be added to your printable with the click of a button. This hack will save you hours of drawing. Instead of wasting time drawing each element give our app a try! It is 100% free with no strings attached! Our free online bullet journal maker enables you to create your own printable bullet journal exactly as you would have drawn it but in a fraction of the time. You can then print each page and insert it into your journal. You can also just use it to plan a page and then copy it in your own handwriting if you prefer. Our bullet journal hacks help you create a perfect bullet journal without spending any time drawing. We have hundreds of journal doodles, frames and titles to select from and add with the click of your mouse. See the video below which shows how to use the free bullet journal maker. You can either draw your bullet journal from scratch. It’s fun but time-consuming and not everyone has time. 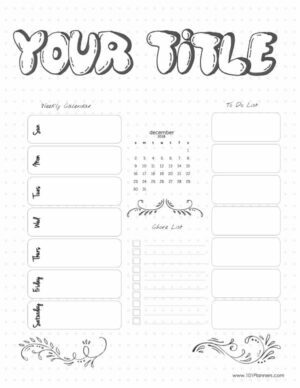 You can use our bullet journal printables if the ready-made templates meet your needs. 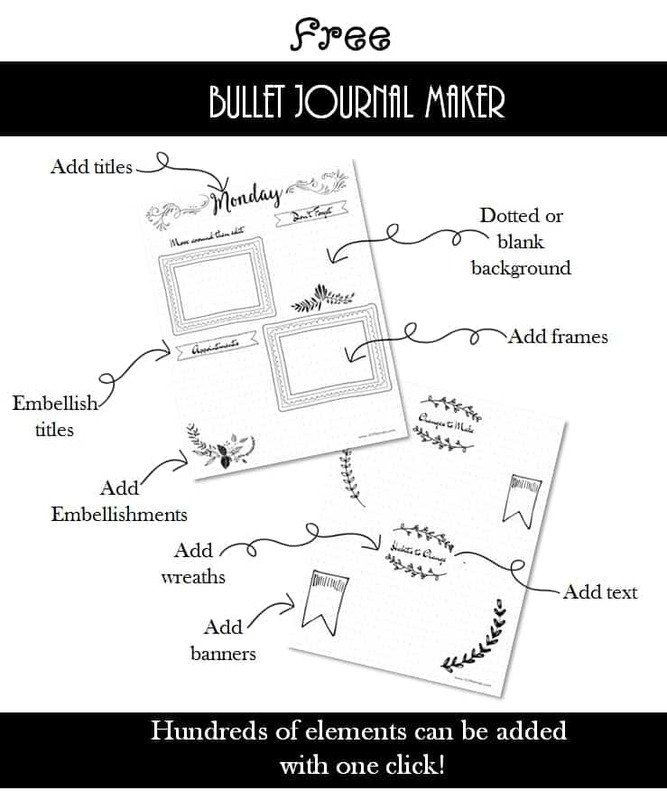 Use our online bullet journal maker to create each page from scratch by adding hand drawn elements with the click of a button. Select from hundreds of elements to achieve the look that you want. Don’t like an element you selected? Erase it and find another one. It is that easy. Select the size of your journal to ensure a perfect fit. You can also create the printable on the full size and use your printer to resize. Select a version with or without a dotted background. Add a frame and elements. We offer hundreds of hand drawn and watercolor elements. After you have chosen an element from a specific category such as banners, date layouts, arrows, go back to check out the other categories. You can scroll down to see additional elements. 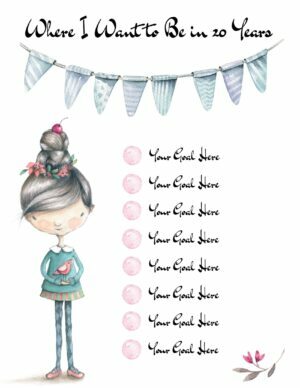 Repeat this process to add additional elements such as banners, embellishments, etc. For example, to add a rectangular frame, select rectangle and you will see a list of the frames that can be used. Click on a frame to select it and it will appear on your bullet journal page. Click on the trash can to remove it, click on the arrow to rotate the element, or click on the 2 arrows on the bottom right corner to make it larger or smaller. You can also drag the element around. If you want more than one element then select another element and it will also appear. You can also color the element by clicking on the element that you want to color and then on the little black box or via the “Change Colors” tab. Once you are happy with the page that you have created you can download it as a PDF document. Click on the “page” icon to do so. Aleenah, I am so glad that you liked it. Thanks so much for recommending it! Thank you for these! This is a lifesaver. I’m wanting to BuJo, but have no idea what to create on the pages. These really help a lot! Best ever!!! I love it so easy to customize and make your own pages. Have not found one like it!! Thank you so much!! !